He got involved by doing what he does best. Tufenkian is founder and CEo of Tufenkian carpets, and in 1993, he opened a factory in Armenia. (Until then, all of the hand woven rugs were made in Nepal.) “We retaught weavers everything their grandparents used to know about carpet –making, but forgot during Soviet times , “he says. By 1999, the Armenian arm of Tufenkian carpets was doing so well that Tufenkian used profits to start a foundation that now supports more than 50 projects, such as recording sacred Armenian music and teaching kids computer skills. Tufenkian hired Irish designer Clodagh to help do the interiors of the 14-room Avan Villa in 2001. Constructed out of pink tufa stone and overlooking the capital, Yerevan, the hotel is decorated with hand-woven 19th-century rugs called kilims and think Tufenkian carpets. Each morning, Armenian coffee and walnuts are served on a hillside terrace. A year later, he introduced the Avan Marak Tsapatagh on lake Sevan , two hours northeast of Yerevan. The hotel uses materials that look like they came right from the earth: cave-like flagstone showers, rock tabletops, sinewy wrought-iron posts. The third hotel, Avan Dzoraget, is in a new building that resembles a castle; it’s on the Debed River, near the ancient monasteries of Haghpat and Sanahin. The modern world feels centuries away. Shepherds drive their flocks down the main street and draw water from a well in the hotel driveway. 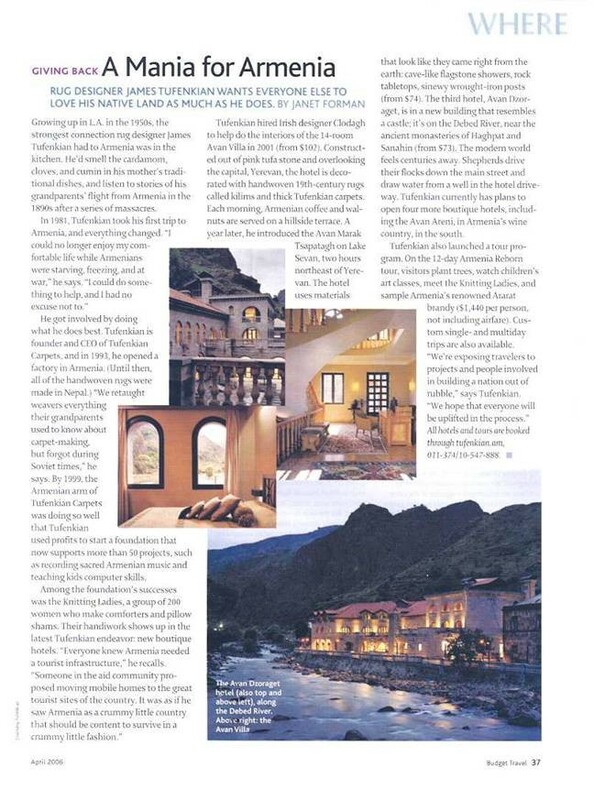 Tufenkian currently plans to open four more boutique hotels, including Avan Areni, in the Armenia’s wine country, in the south.